Last year Jo Avery of myBearpaw invited me to join in with her Vintage Home BOM Quilt Along. 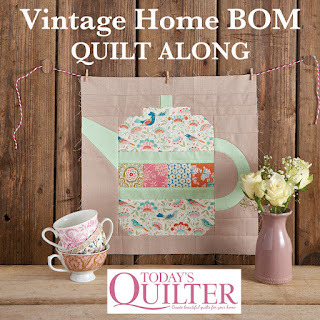 Each month in Today's Quilter a new block is released and features items from around the home, with a bit of a vintage or retro twist. 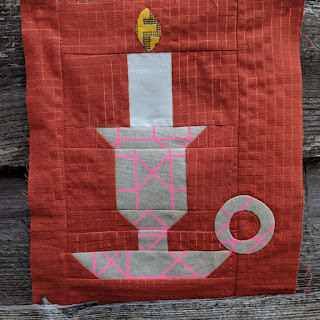 I chose May's block, with the theme of light and decided to make the candlestick block. This one spoke to me as my name, Lucy, comes from Latin origin and means "light" - I even have it tattooed on my wrist! The blocks are machine sewn, a few have a small amount of foundation paper piecing but this one is made with regular machine piecing and a little bit of hand appliqué. I decided to challenge myself a bit by mixing different weights of fabric in the block. 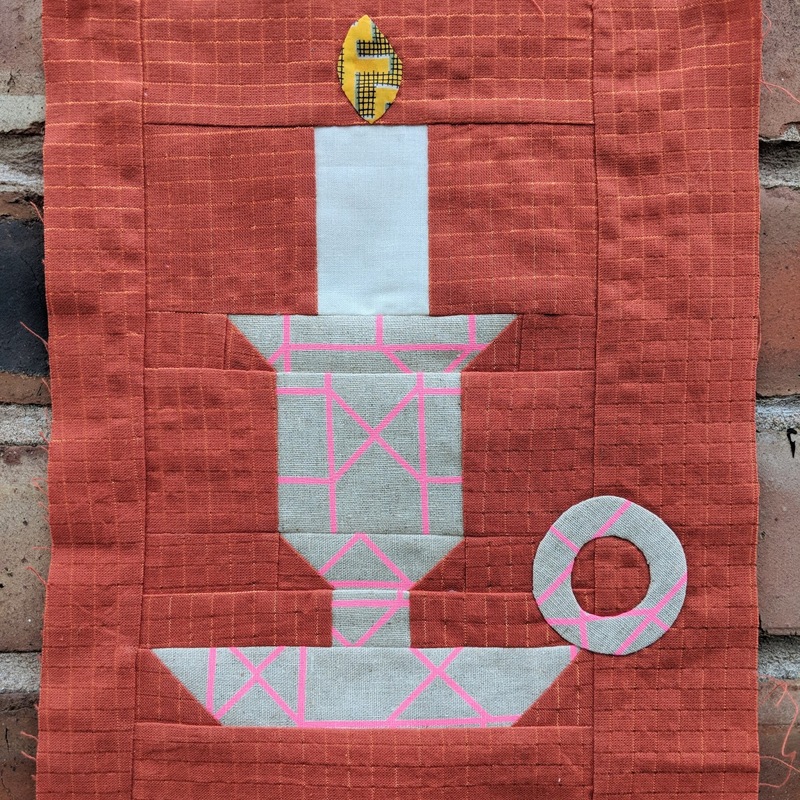 The background is the beautiful woven Illuminated Graph in Rust, Loominous by Anna Maria Horner and the candlestick holder is a Japanese geometric lines linen. This print is one of my favourites, I see it often because I used it for the basket that holds my everyday make up! 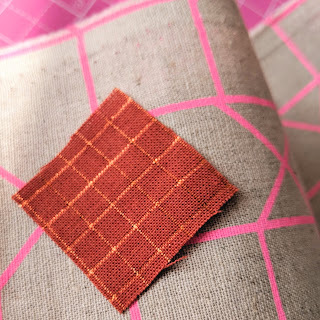 I like how these fabrics play together, both have a different vibe and yet the lines create a relationship. The orange toned rust colour of the background gives that warm glow you get from a candle too. For the flame itself I cut into my precious Liberty, the Farhad print is perfect and I thought the black grid on it looked good as a representation of the wick. The hand appliqué was quick to do, just the flame and the circular candlestick holder. 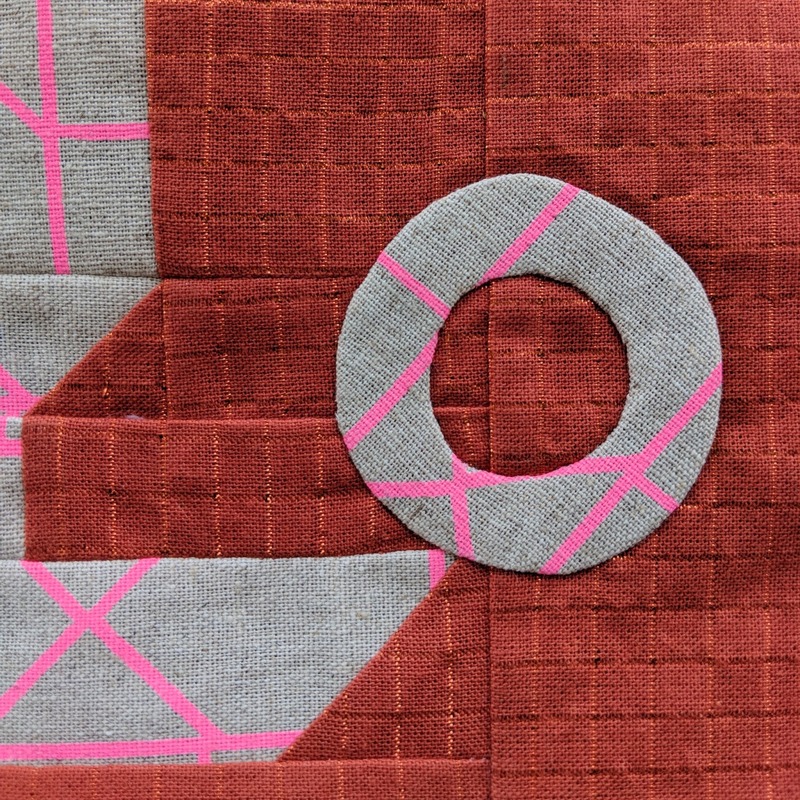 I didn't clip the outer part of the circle, as it's linen I didn't want it to fray too much and it was large enough that I didn't need to. I did clip the inner circle though and it behaved relatively well! I'm really happy with the block and the overall warm feeling of it. Candles give the most wonderful soft light and it's so lovely to enjoy lighting them and getting that pretty glow, even the quiet burning sound and the way they melt can be relaxing. I thought it would be fun to share some of the candles I love! There is some debate about the environmental impact and chemicals in candle wax and fragrances. You can decide whether this is something you want to research and pay attention to. For me, I'm using the ones I have! My current favourites include two that were gifted to me - the first is from Neom, a gorgeous Happiness candle fragranced with White Neroli, Mimosa and Lemon. It's delicately floral and has a lovely citrus freshness. Then there's the Woodwick candle, I have the medium Fireside which has a deep woody scent with Amber, Vetiver and Musk. The most amazing thing about this candle is it's crackle, it's literally like being next to a cosy fireplace! I also have a couple of Jo Malone candles, from my time working for Estée Lauder and the candle fragrances are beautiful and extensive. Finally my most recent candle purchases are from candles_n_vintagestuff. Angela makes EcoSoya wax candles in the most fabulous vintage containers, like jars, tins and teacups. Plus they smell absolutely amazing! Clearly I love candles! 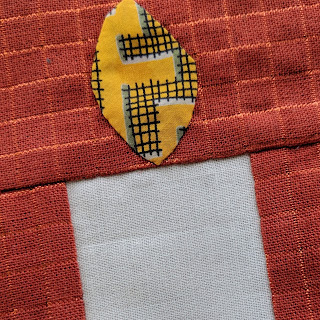 This block was a joy to sew and it was nice to have some hand sewn elements included. Jo's patterns are so easy to follow and the other blocks in the BOM are all so sweet, the theme is charming! You can find the candlestick, along with a lampshade block in issue 36 of Today's Quilter.